Imagine the Chicago Cubs winning a World Series. Seriously, picture the idea of baseball’s lovable losers finally having things go their way just long enough for them to finish the season on top for the first time since 1908. How would you write that script? It couldn’t be easy because a team and fan base who have been starved for a championship for well over a century simply can’t win a best-of-seven series that easily. Absolutely not. That’s not the kind of finale that makes great stories, at least not this story. What if I told you that the Cubs would become the first team to overcome a 3-1 series deficit in the World Series since the 1985 Kansas City Royals? That sounds more like it, doesn’t it? What if I told you that the seventh game wouldn’t be decided in regulation, and wouldn’t even be decided until after a rain delay separated the ninth inning from the 10th? Chicago Cubs center fielder Dexter Fowler hits a solo home run against the Cleveland Indians in the first inning of Game 7 of the 2016 World Series at Progressive Field. Now we’re cooking with gas. Besides that, what if I told you that the Cubs – with their 8-7 victory in extra innings – passed the torch of longest championship drought in baseball onto the team they beat – the Cleveland baseball team – at 68 years? Maybe one could see all of the various challenges the World Series favorites and league leader in wins (103) would face, but there is no way anyone could’ve written a better championship script for the Cubs. At every opportunity to give up looking at the “insurmountable” situation the team found itself in, Chicago kept fighting, which is the purest thing in the heart of true champion. 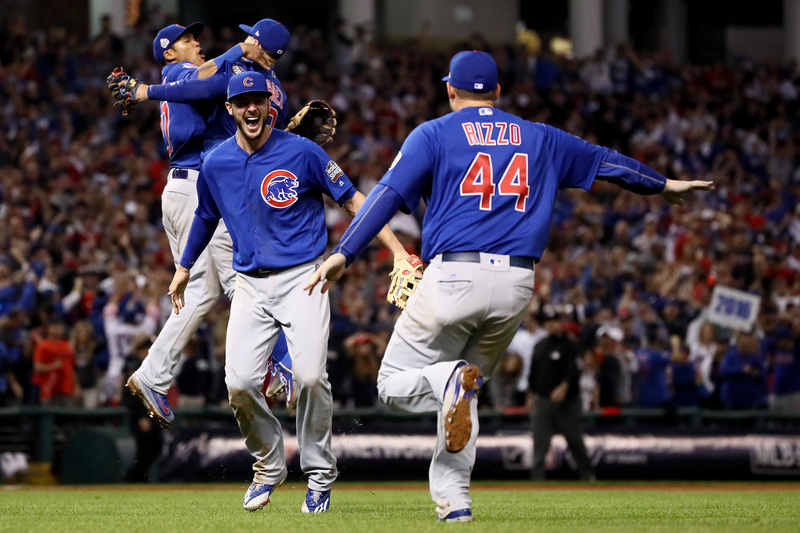 Maybe Chicago, the fifth-youngest team in baseball, was inspired after watching the Cleveland Cavaliers turn the same trick, becoming the first NBA team to overcome a 3-1 deficit in NBA Finals history, and used that motivation against the Cavaliers’ neighbors. 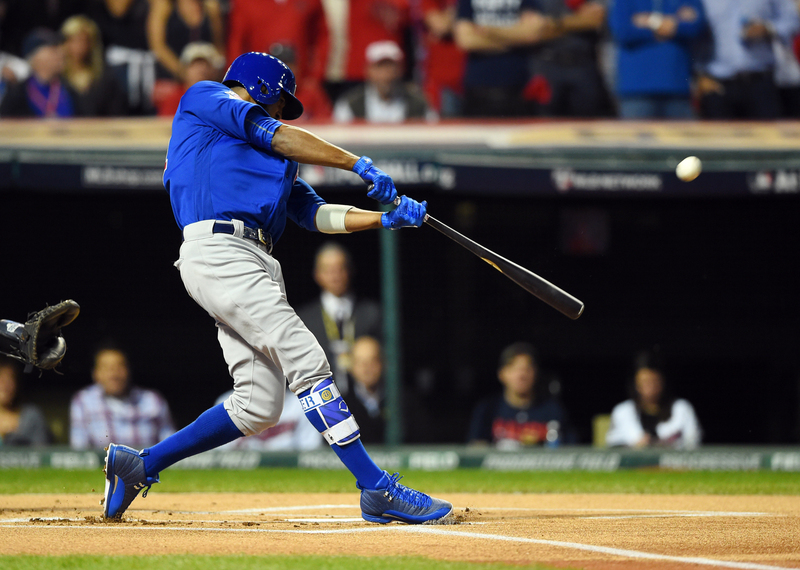 Even the way the team kicked off Game 7 was historic, as the first black man to play for the Cubs in a World Series game, Dexter Fowler, led the game off with a solo home run, becoming the first player to do so in a winner-take-all Game 7. 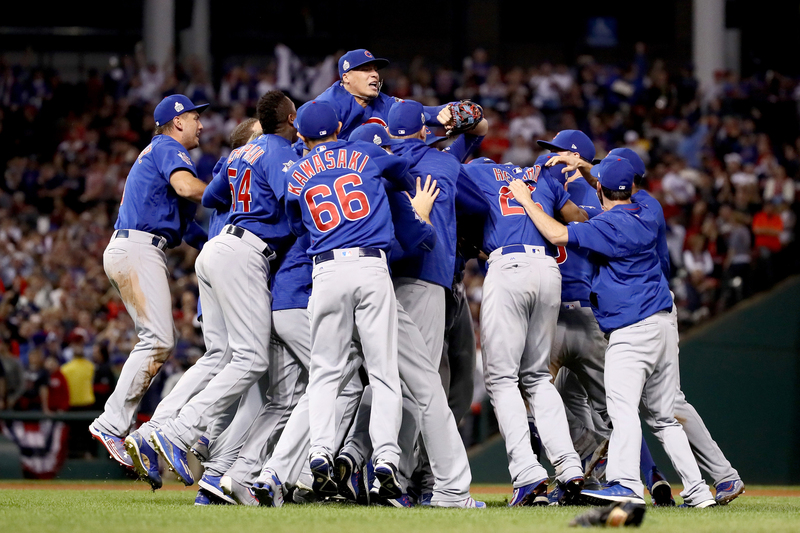 One doesn’t have to believe in the Billy Goat Curse, but you best believe that this is exactly how the Chicago Cubs walked out of Progressive Field in Cleveland — champagne-soaked and with the World Series trophy in tow. Pinch yourself, because after watching this Cubs team in the World Series, you should believe in miracles. Kris Bryant (No. 17) and Anthony Rizzo (No. 44) of the Chicago Cubs celebrate after defeating the Cleveland Indians 8-7 in Game 7 of the 2016 World Series at Progressive Field on Nov. 2 in Cleveland. The Cubs won their first World Series in 108 years. Cubs catcher David Ross was unable to corral a wild pitch in the bottom of the fifth inning, and two Cleveland players were able to reach home plate. That made the score, 5-3. Ross, who was playing in his last big league game, wasn’t bothered by the mistake. He sent a long ball to dead center field (406 feet) in the top of the sixth inning to increase the Cubs’ lead to 6-3, and become the oldest player in history to homer in Game 7 of the World Series. The score stayed that way until the bottom of the eighth inning. Cubs ace Jon Lester, who made his first relief appearance in nine years, left the inning with only Jesse Ramirez on base after he singled. Cubs manager Joe Maddon opted to bring in closer Aroldis Chapman, whom the team acquired from the New York Yankees in July. Chapman was brought to the team to deliver the heat because of his ability to pitch well into the hundreds. His specialty worked against Chapman as Brandon Guyer managed to hit a run-scoring double off him. 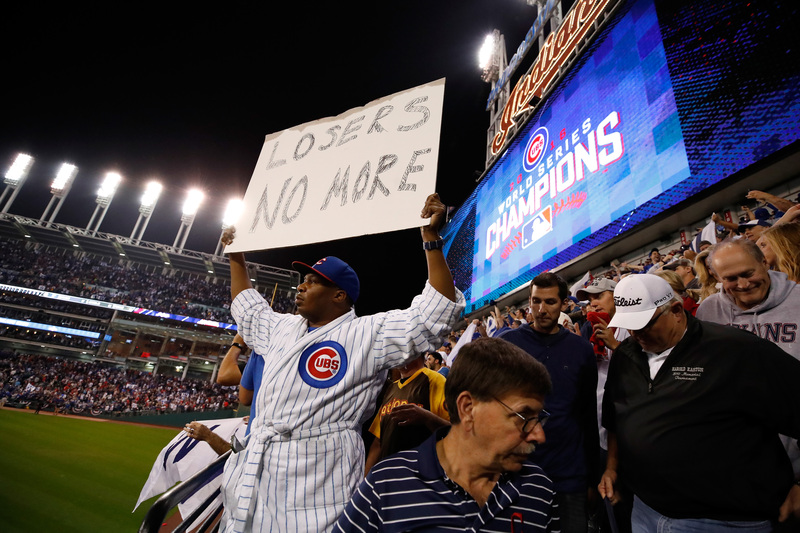 A Chicago Cubs fan holds a sign after the Cubs defeated the Cleveland Indians 8-7 in Game 7 of the 2016 World Series at Progressive Field on Nov. 2 in Cleveland. The Cubs won their first World Series in 108 years. This is when it felt like the Cubs were, somehow, someway, going to come up just short of victory because of their demons. Cleveland’s Rajai Davis delivered with a solo shot just inside of the left-field foul pole to tie the game at 6-6. And then it appeared Chicago was going to do the work of its demons, when Maddon had Javier Baez bunt with one out, two strikes, in an attempt to bring Jason Heyward home. Baez struck out, and the Cubs limped into the bottom of the ninth inning. Chapman was able to close out the game without further damage, and then the rain came. The perfect storm that one thought was for Cleveland actually turned out to be for Chicago, as World Series MVP Ben Zobrist managed to deliver the Cubs the lead by driving home an RBI double down the left-field line in the 10th inning. Miguel Montero brought home what would ultimately be the winning run with a single. The Chicago Cubs celebrate after defeating the Cleveland Indians, 8-7, in Game 7 of the 2016 World Series at Progressive Field on Nov. 2 in Cleveland. The Cubs won their first World Series in 108 years.